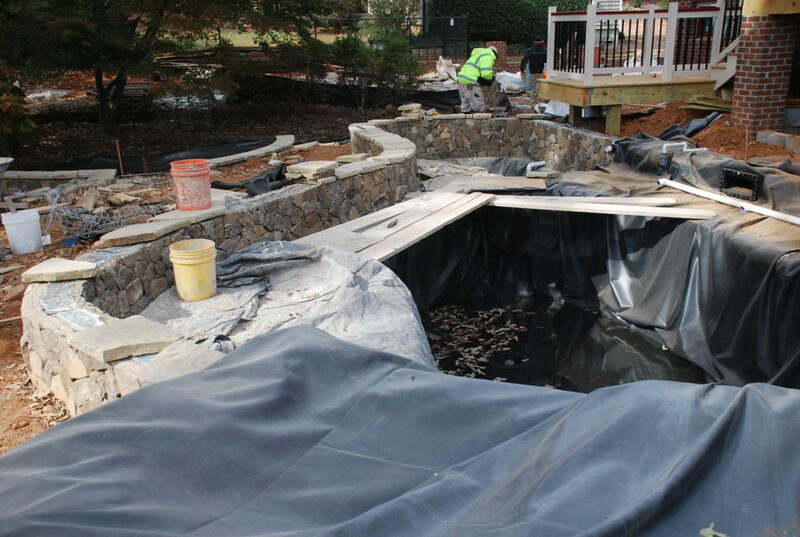 One last part of the pond that Doug’s crew will work on is the mortared stonework at the low walls that surround it. Chuck and Doug and Dale discussed the vision and mapped out a strategy. We had previously visited one of the local stone suppliers and selected a style which the masons had already used on the outside face of the wall, and we’ll continue to use it on the inside face. 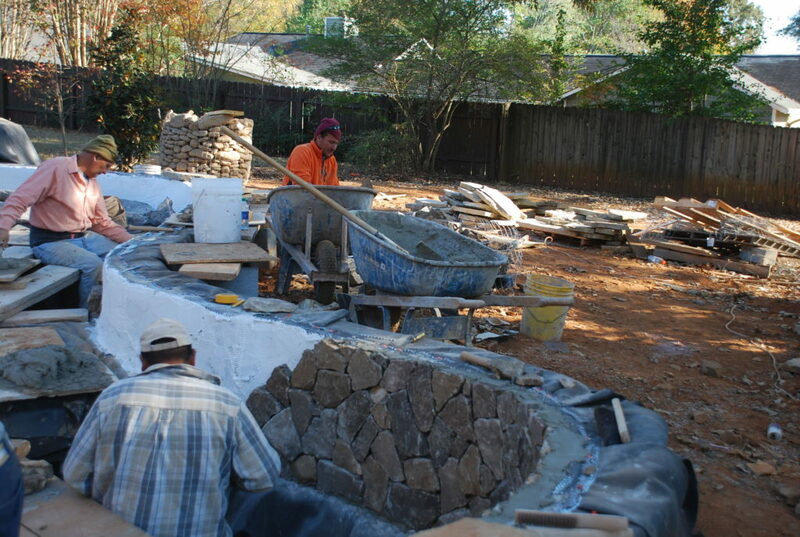 It is looking great and will tie in nicely with the stacked boulder/stone work that is soon to come. The masons set to work putting the stone along the inside face of the wall. The deepest section of the pond is about 6′ deep, so they rigged up some temporary scaffolding to work from in that area. First they applied some metal lath along the inside face of the liner so that the stone would have something to hold on to. That was treated with waterproofing and then the stone was mortared on. The stone just goes down to the footing under the wall and the liner is exposed below that. 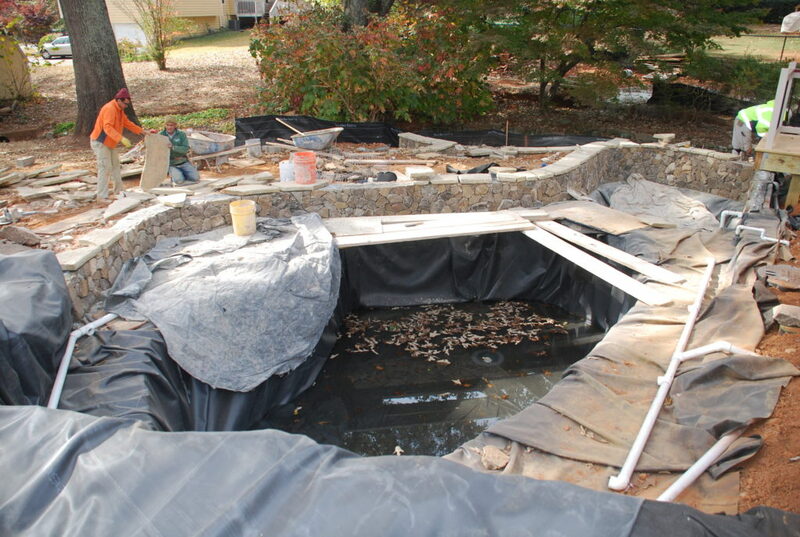 The liner will be a good bit below water and should be obscured by plants and stone that will come later. Before long they had the veneer completed on the inside face of the wall. 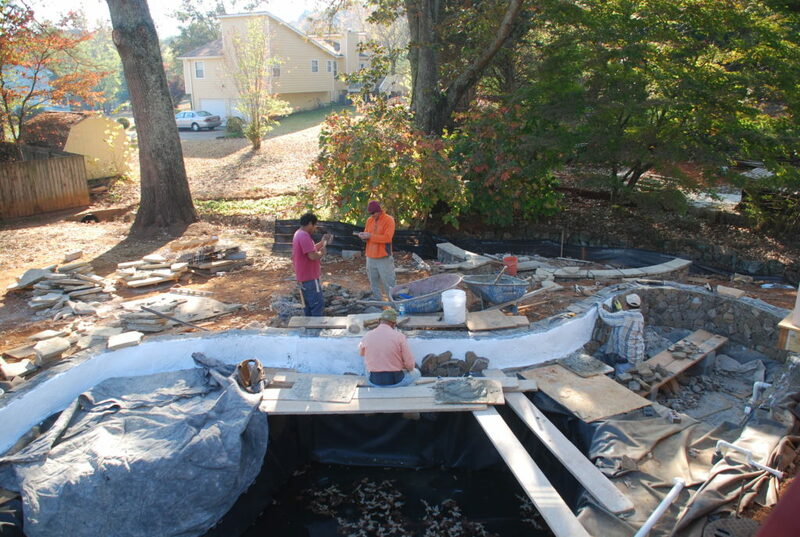 Here’s a view from the stream bed where you can see the wall finished. At the left end of the wall will be the waterfall structure which will be more of a natural stone look. 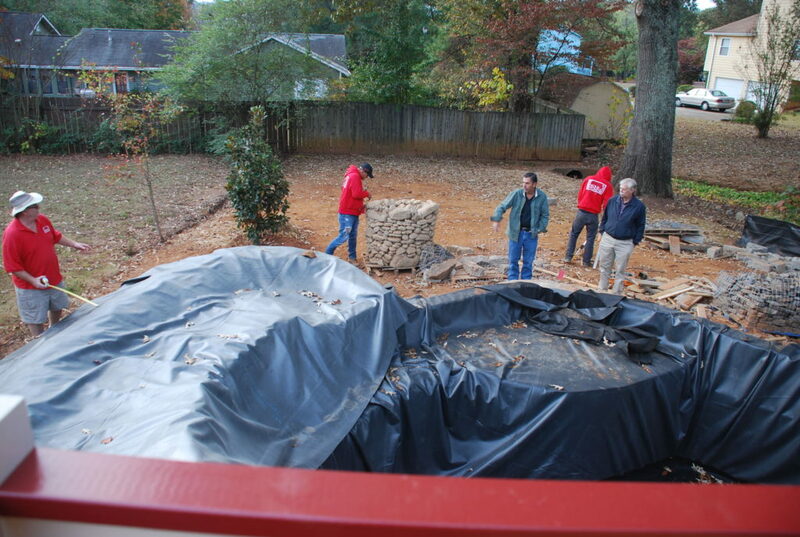 The liner under the stream bed doesn’t look like much yet, but it will be fabulous once Chuck’s guys get through with it. Back inside there are a thousand little details that have to be handled. 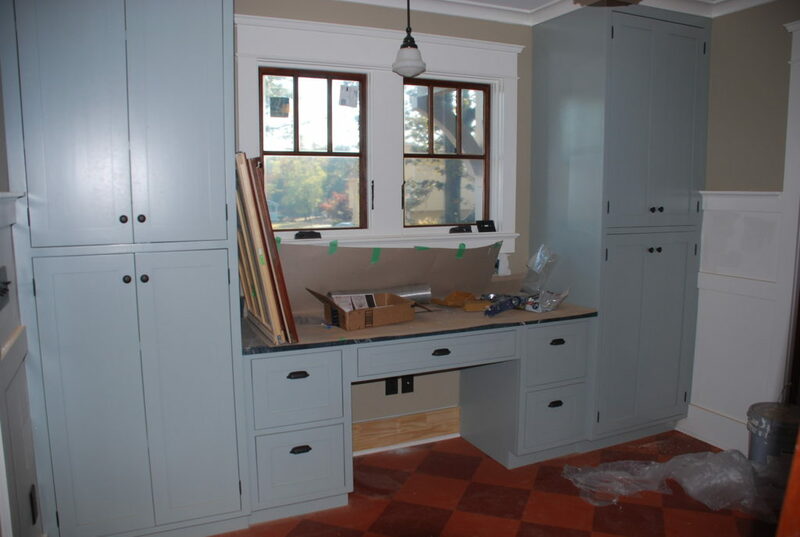 One of the biggest jobs of new construction (or renovation) is the clean-up! Seems like it never ends, but now that the dust is starting to settle some, it is time for some serious cleaning. One of the places that will show the most will be the windows. They were all shipped with plastic film on them, but even after that comes off, there is still some serious cleaning to do. 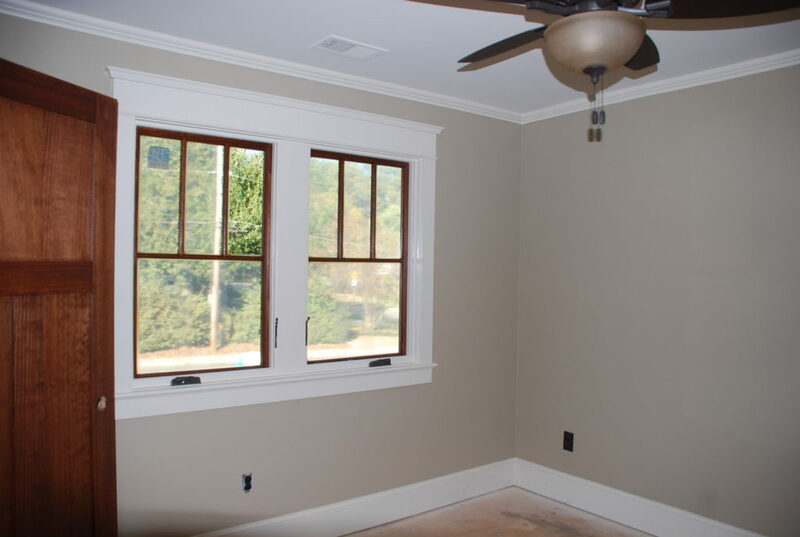 Here you can see that one pane of the left window has been cleaned – sure makes a difference. 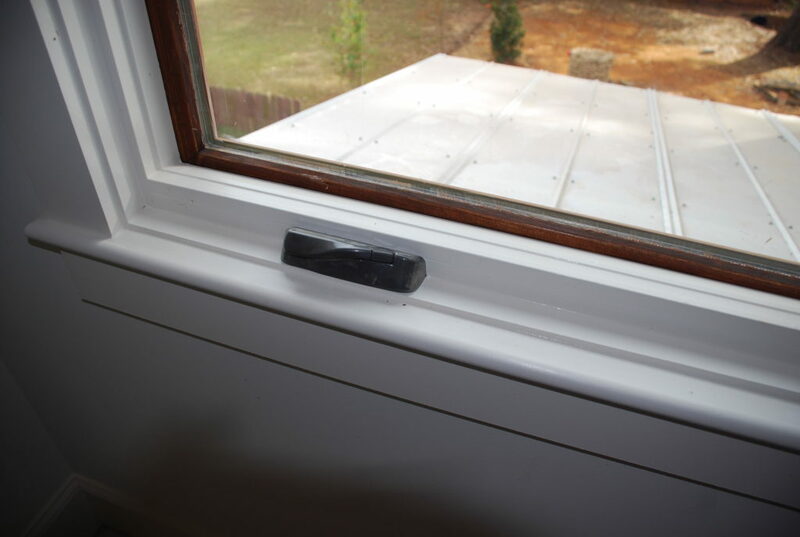 It is also time to replace the temporary construction hardware on the casement windows. They were shipped with plastic thumbscrew type opening devices that were a real pain to use, but the permanent ones are much better. Here’s one in place and closed, and below you can see it in the open position. The stained sashes really look great in the painted frames. 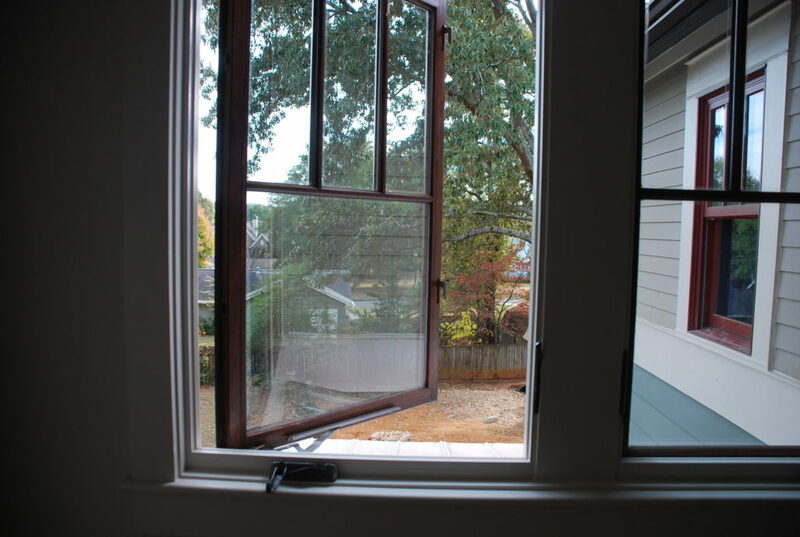 Another interesting feature of the casements is that the screens are designed to be mounted on the inside of the window so the sashes can open with the screens still in place. The screens are all in the Basement waiting for installation. 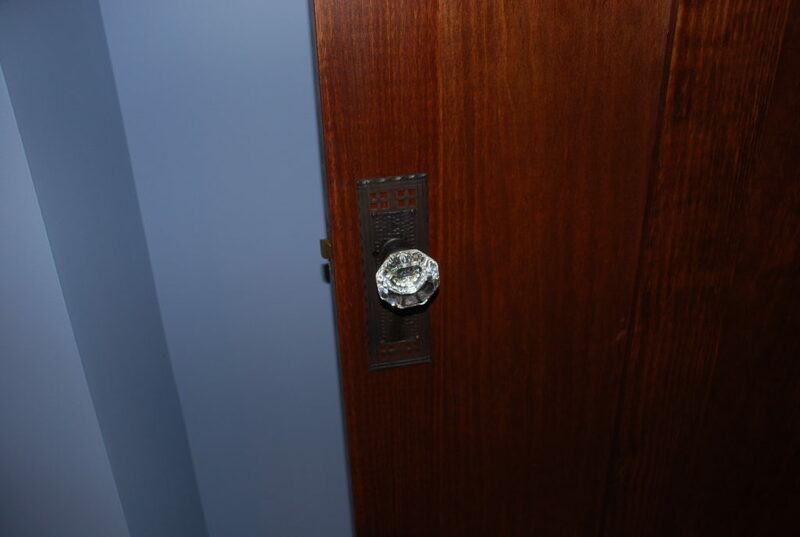 The bushings came in for the interior door hardware, so Clint was back at work this week getting them all installed. 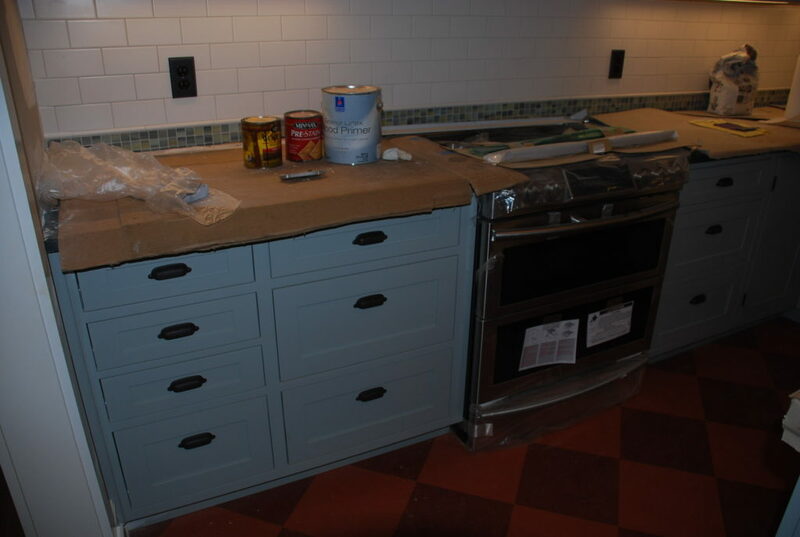 We purchased bin pulls for all the drawers in the custom cabinets and Jeff came by this week and installed all of them along with the knobs in the Kitchen, Pantry and Master Bathroom. Here’s the Pantry with all the hardware in place. We’re getting a little bit closer. 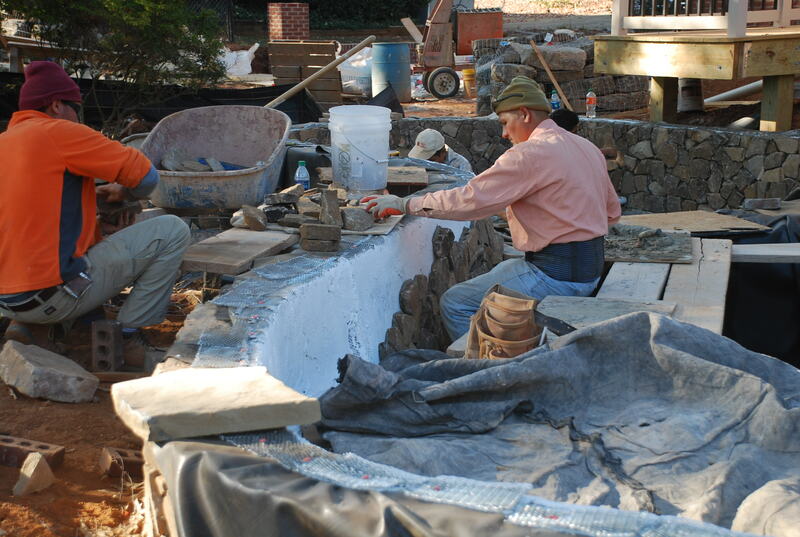 Viktor came by and wrapped up a few more details on the colonnade and fireplace. One more trip and they should be ready for stain. 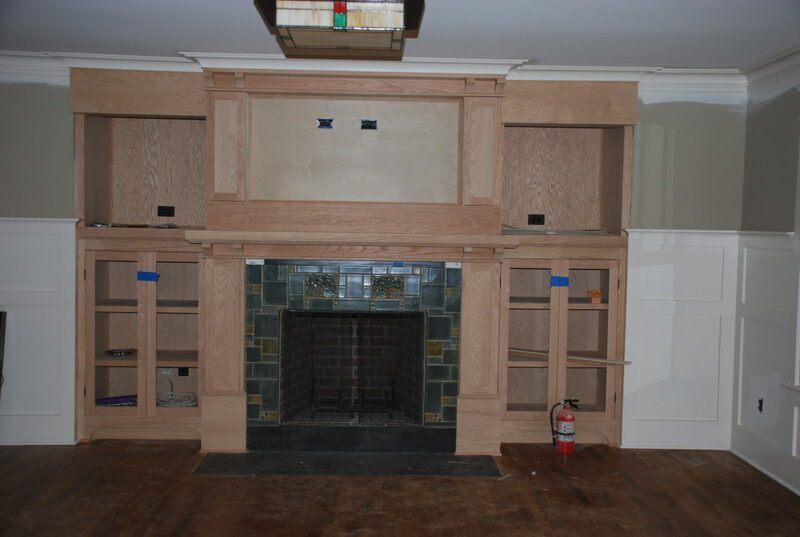 The mantle at the fireplace is also coming together nicely and nearly ready for stain. And all the while, our painters have been working hard trying to keep up. 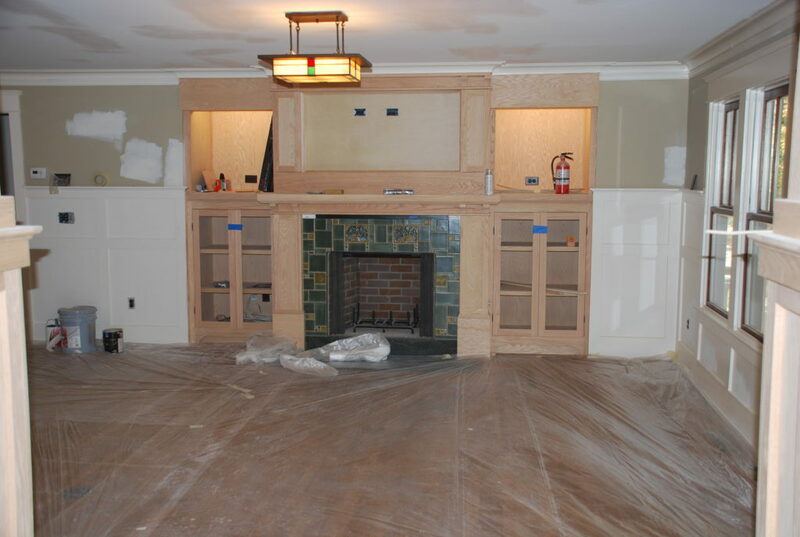 You can see where the drywall has been patched and re-sanded and will need another painting. 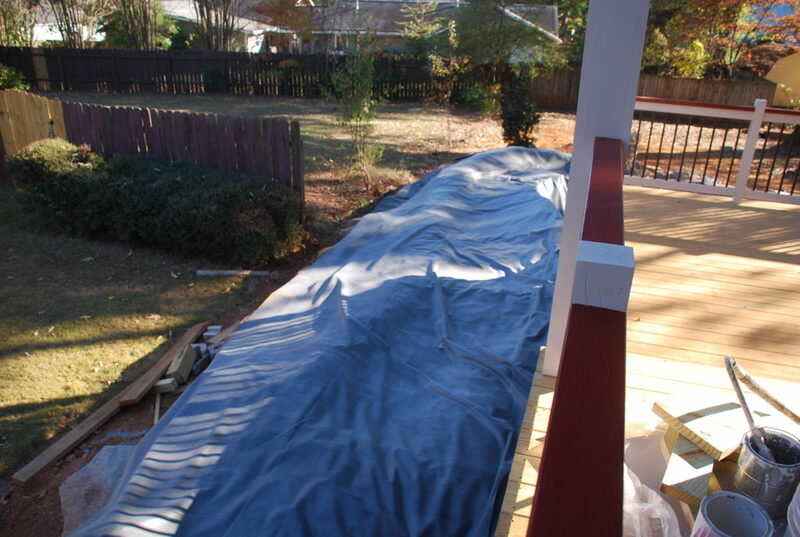 The plastic is there to protect the hardwoods from all the paint touch-up. 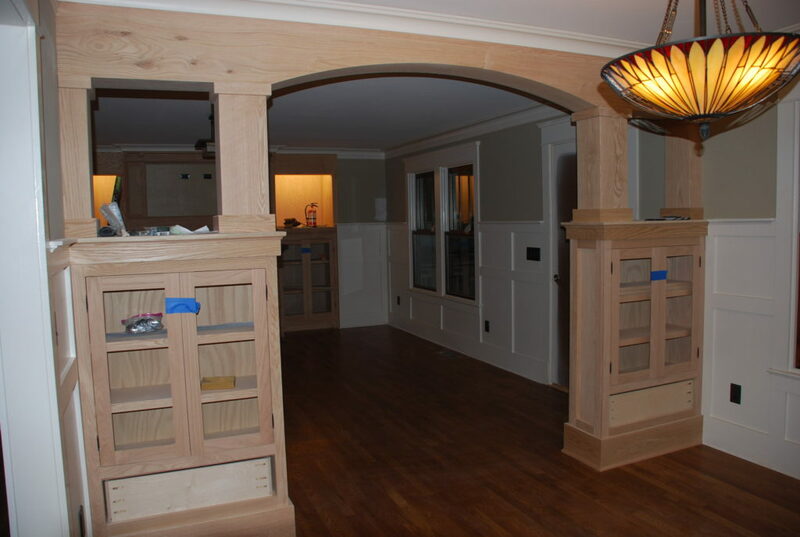 Another productive week – and hoping to see some milestones reached next week – like staining the colonnade & fireplace cabinets, and getting the fence in around back. Still lots to do . . .